You will be given a reference e-book to read which has 655 pages And the test will be based on that e-book , you can take final test within 1 year of purchase. What is Information Technology Audit? Information technology audit refers to the process of examining the management controls found inside an IT infrastructure. It works by gathering evidences and evaluating them as a means of determining if the installed IT systems within an organization works in safeguarding assets, operating efficiently as a means of achieving the goals and objectives of a business organization and maintaining the integrity of data. The evaluation process as well as the entire information technology audit procedure is usually conducted along with internal and financial statement audit and any other types of attestation engagement. One of the major functions of IT audit is to spend time evaluating the effectiveness and internal control design of an IT system. These include the evaluation of the efficiency of security protocols, IT governance and development processes. It should also be noted that information technology audit is carried out using 3 systematic approaches. The first one is called the technological innovation process audit which involves the creation of risk profiles for all new and present projects. This also involves the assessment of the depth and length of the experience of your company when using your chosen technologies. The second one is called innovative comparison audit which involves analyzing innovative abilities of the audited company when compared to competitors and technological position audit which works by reviewing all technologies used by a company at present and those technologies that they are planning to add. If expanding the level of your knowledge about the IT audit industry has been one of your major goals, then the related online certification course called information technology audit certification program offered by Brainmeasures is ideal for you. Enrolling in this information technology audit course is a wise decision since it works in your attempt to get only the most accurate and updated information relevant to the field. This certification course allows you to access Brainmeasures information technology audit training which is a huge help in mastering every essential terms and concepts linked to IT audit, its scope, its benefits, reasons why you need to implement it, the different systematic approaches that you can use when trying to effectively implement IT audit and the different categories of audit. The information technology audit certificate that you will receive right after you complete the certification course can help you grab more rewarding opportunities. 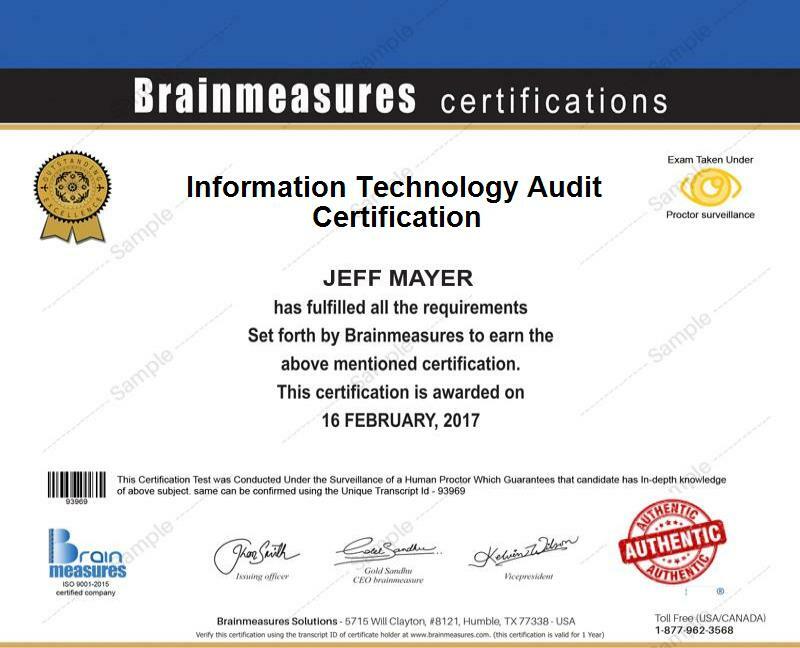 The information technology audit certification program which is now accessible at Brainmeasures is versatile enough to meet the different demands of its participants when it comes to learning. It primarily targets IT auditors, IT audit specialists, IT system administrators, IT security professionals and any other individuals and professionals in the IT industry who are responsible in making sure that the IT infrastructure in their organization are well-audited and protected. Applying for a position in an organization while also showing your information technology audit certification can also reward you with a higher salary. Your information technology audit certification can be used to apply for the position of information technology auditor and earn within the range of $52,000 to $96,000 from this profession yearly. It is also greatly possible for you to work as an information technology audit manager and enjoy up to $141,000 annually.